HVAC system performance issues found and displayed easily. All from the convenience of your phone. For the low, low cost of free. Wow your customers and simplify your HVAC testing. The AirMaxx Lite™ app is available for both Android and iOS phones. It features easy-to-use data entry and easy-to-display reports to homeowners. 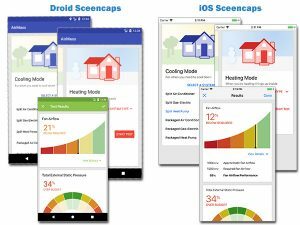 Now you can download this app onto your phone or tablet and use this great tool for displaying an airflow ‘grade’ for your customers. All you have to do is collect some simple nameplate information, then measure and input two static pressure values, and the app does the rest! The results are shown in graphs and wording that your customers can understand. Included via a link in the app are assets and articles to help you perform static pressure measurements and what they mean. Get started on the path to Performance-Based Contracting™ today by downloading the app for FREE from the app store of your device by using the links below. Get started right away with National Comfort Institute’s AirMaxx Lite!